Turbomachines are high-quality machines used in areas like power plants or the process industry. Rotors from turbomachines place special demands on balancing technology. Steam turbines, gas turbines, turbo generators and turbo compressors are machines whose rotors usually run beyond at least one critical speed. Therefore, they are balanced as flexible rotors. The HS type high-speed balancing and spin testing installations meet all requirements for balancing and spinning flexible rotors with multiple correction planes and multiple speeds. Flexible concepts – for example for propulsion and safety structures – enable Hofmann to optimally adapt the high-speed balancing and spin testing installations to specific project requirements, or to provide them as turn-key solutions. In addition to balancing, rotors from turbomachines undergo further special tests. 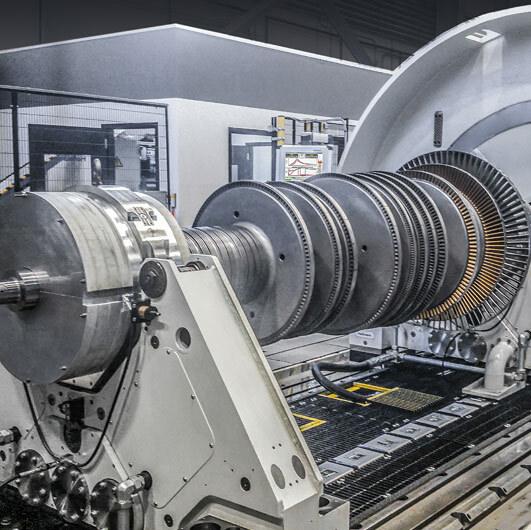 For example, the field winding of a turbo generator is supplied with electric current in order to evaluate the influence of rotor heating on the balancing result. Magnetic field and electric impedance measurements are performed on the rotating rotor to determine the electrical properties and detect winding defects. With many rotors from turbomachines, the runout testing must meet specific requirements. Hofmann’s type UHR runout testing machines measure all important runout values (total, mechanical, electrical) with the rotor set in V-blocks. To check on-site runout, the RO 7000 portable runout testing system is used. The high-speed balancing and over-speed testing installations are used to balance flexible rotors under operational conditions and to perform spin tests at over-speed. Hofmann HS installations cover rotor weights from just a few kilograms up to 100 tons. 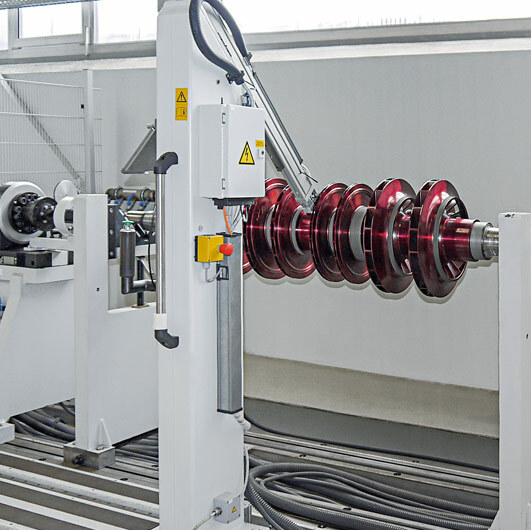 Hofmann’s type UHR Runout-Testing machines measure the mechanical, radial and axial runout of rotors in multiple axial planes. Runout is measured with both a tactile sensor (mechanical runout) and an eddy sensor (total runout). The difference between the total and mechanical runout yields the “electrical runout” (the systematic measurement error of the eddy current sensor). The results of the runout measurements are used to compare given values with target values and to perform corrections, when necessary. A rotor is placed on V-blocks for runout measurement and is driven jolt-free using an end-drive. Hofmann’s Runout Testing System RO 7000 provides a solution to measure the mechanical, radial and axial runout of rotors in multiple axial planes. Runout is measured with both a tactile sensor (mechanical runout) and an eddy current sensor (total runout). The difference between the total and mechanical runout yields the “electrical runout” (the systematic measurement error of the eddy current sensor). The results of the runout measurements are used to compare given values with target values and to perform corrections, when necessary.